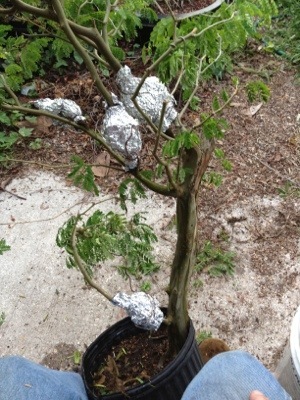 I was hoping to do a styling or carving post next but propagation in the nursery (real work) is calling. This post will explain a bit on the why, when,how and “uh ohs!” of air layering. 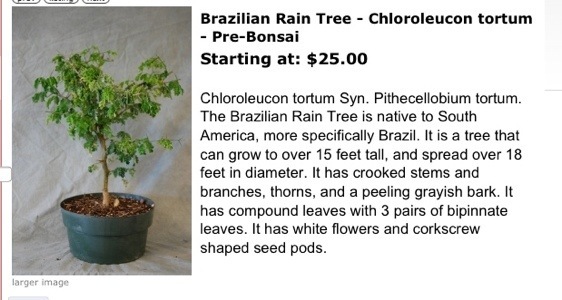 The species I am using is the Brazilian Raintree. Erik Wigert is an excellent source for tropical trees and a good friend. Visit his site. 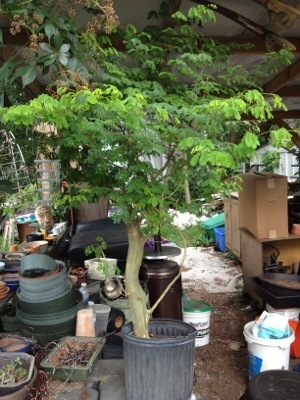 The story of the Raintree can be found many places on the Internet and its introduction to bonsai by Jim Moody of Jupiter Bonsai so I will not repeat it here. Needless to say, it has been adopted and well accepted in the bonsai world. 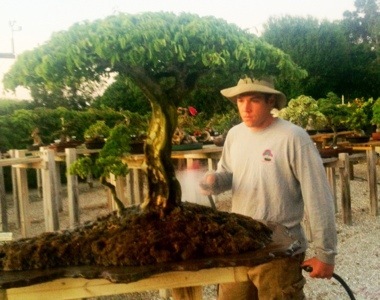 Erik with one of his specimen trees. 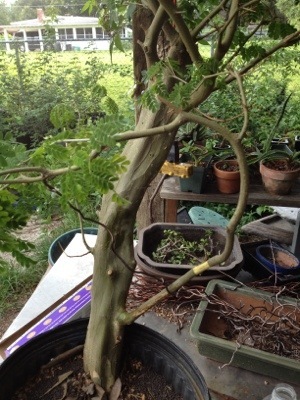 I chose the Raintree because it is an easy tree to do this on. Some people have had quick success, getting viable roots within a few weeks. And I just SO need more tropicals to shove into my greenhouse come winter. 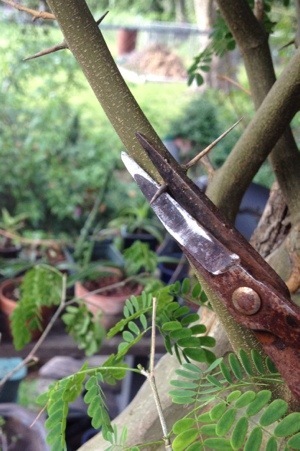 Next, cut off thorns. 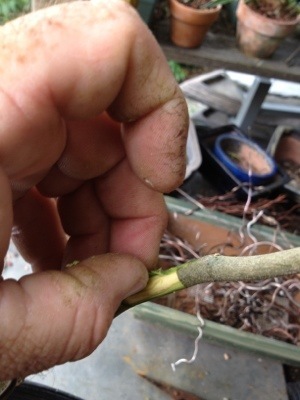 This is only so I don’t prick my finger…….A recurring theme in this blog. We remove the bark by making two circumnavigational (like that word?) cuts around the branch about an inch (or more depending on the thickness of said branch) and scraping, peeling and cajoling the material away. 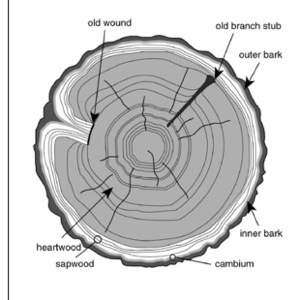 It’s best to Not damage the woody part (the sapwood or xylem) as this is important in the process we are exploiting. To put it really simply- the sapwood transports water (and nutrients) to the branch tip and allows photosynthesis (along with the sun) to occur, which manufactures sugar (and other stuff). 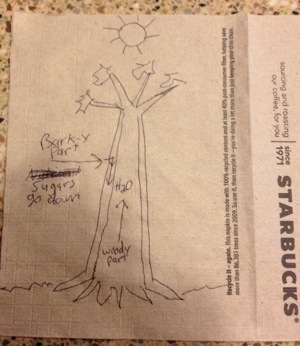 The bark and the cambiums ( and the phloems) job is to move that sugar (and other stuff) to the bottom of the tree. Anyway, when we traumatize this poor tree we are disrupting this fantastic mechanism and causing the sugar (and other stuff) to pool, so to say, at the cut. The important part of all this is that “other stuff”. Which is a chemical called auxin. Auxin is responsible for the development of both branches and, in our case, roots. There is a complex scientific explanation for all this (of course,but that is dull and I want you to continue reading) so,basically: latent, adventitious buds can create either roots or leaves (branches). 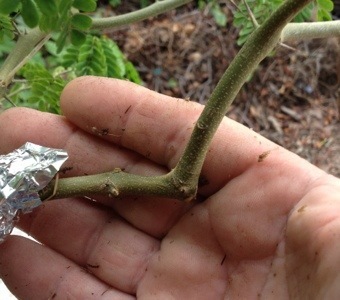 When we prune the top of the tree we cause the auxins to pool at the next bud and we get new growth. If we girdle the tree the auxins will pool at that site and…..
Take some sphagnum moss which has been soaking in water ( missed that step? Go back to the beginning and re-read that part). Some people use plastic wrap or a pot etc. I use aluminum because it is moldable and it doesn’t let light in. Being moldable means its easy to apply and will stay where I put it. The light issue is two fold. The auxins will cause the buds to either be a leaf or a root. The factor that decides this is the presence of light. With light, leaves, without light, roots. The second reason is temperature. 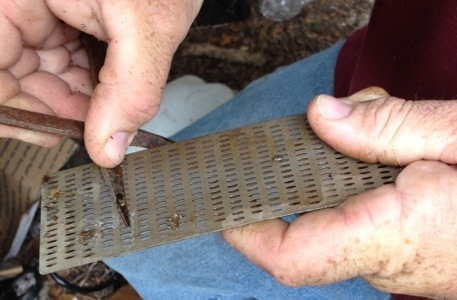 Roots only grow between 40 and 90 Fahrenheit. I live in Florida. If I used clear plastic, which is a good material for greenhouses, the temp inside that ball of moss will be way (I mean way!) too hot for roots to form. Causing the Airlayer to languish and callous over instead of , well, layer. Kinda looks funky. Hope the DEA doesn’t come and ask questions. This post is way too sarcastic for those humorless people. If you noticed, I only put one layer per branch line. If you put two on one branch it kinda defeats the mechanism we are messing with. 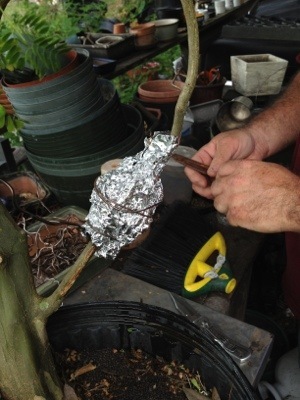 Thirdly, some plants are impossible to grow from cuttings or even seed but air layering works. The “how ” question I think I explained. When? When the tree is growing. Which usually means spring through summer. 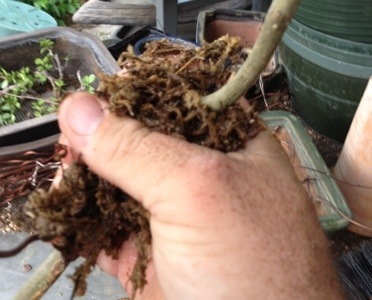 Some trees are faster at setting new roots. 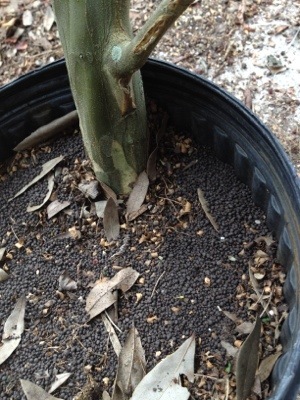 Some take years (bucida spinosa, dwarf black olive for one). 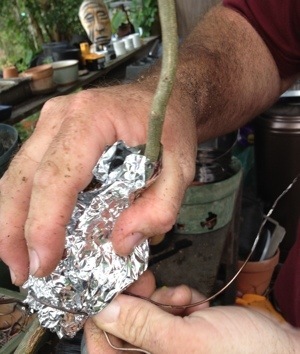 Others need a larger cut, some only need a tight wire wrapped around it. 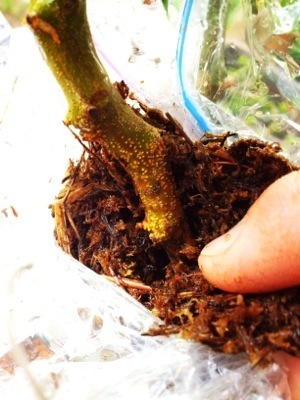 There is a related method called ground layering which means you bury a branch (still attached to host) in the ground and get the same results. Now to address those wiseguys in the back rows whispering “how come he’s not using rooting hormone?” to one another. The answer- I don’t find a need for it. It works with or without it. If you need to use it, feel free. I don’t lubricate the o-ring on the oil filter when I install it either. 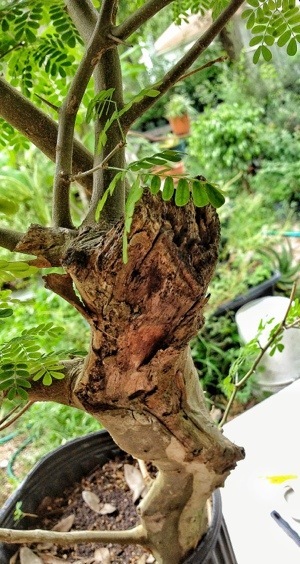 Notice the white nodules building up on the branch? I don’t suggest you expose the layer until at least a month to check. 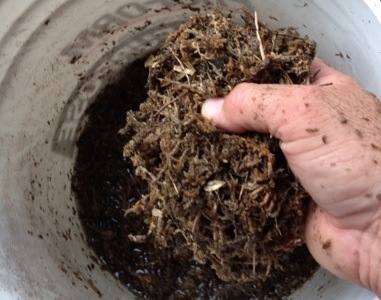 I use milorganite. And cut back the top a bit. Keep it well watered (or city water, if that’s what you use, though rain is best) and don’t forget about it. I plan on carving the top out and making the tree into a bunjin. But, alas, that’s after I get some work done. I need an apprentice. Hi nice pics. How can I get some rain seeds?.